The Papua New Guinea National Agriculture research Institute (NARI) has released four new taro varieties in the hope of developing a commercial and weather resilient taro crop. NARI’s deputy director general Dr Akkinapally Ramakrishna, in presenting the taro varieties, said the taro varieties were an improvement on those it had previously released. The deputy director general said the four varieties are improved versions of NT 1, 2, 3 and 4. He said the improvement to the taro varieties commenced in 2007. “The NT 1, 2, 3 and 4 are currently widely accepted in the country, and many farmers are growing them,” Dr Ramakrishna said. However, Dr Ramakrisna said varieties NT 5, 6, 7, and 8 are much better. “These new varieties are much better and farmers can grow them under any climate.” He added that tests are being conducted in various communities in Madang, the Eastern Highlands, East New Britain and also within Morobe Province. “NARI is ready and will be providing the taro seedling and planting materials for free to communities and individuals who are willing to take them on,” Dr Ramakrishna said. 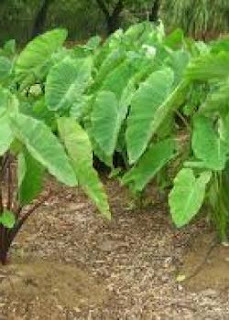 Meanwhile, the Morobe provincial government revealed that the Buhalu Taro project has gotten off the ground and the Bukawa people are ensuring that taro makes its mark within the agriculture industry.